Equine-facilitated therapy for riders with and without challenges, especially involved with Special Olympics Equestrian training for the State Summer Games, wounded soldiers, children and adults with specific developmental delays in an inclusive, bucolic environment. Beatuiful small farm providing full service field board. Shelters, pastures and fencing are excellent. There is auto heated water, an outdoor arena and round pen as well as other amenities. Near Lisbon. Timber Falls Tree Farm is a wholesale nursery, and only does retail sales of Christmas greens for group fundraisers. Tin Lizzie Wineworks offers instructions and equipment so you can make your own wines. The Wineworks is named after the 1915 Model T that was kept by the farm’s owner. “Lizzie” was early 20th century slang for a reliable servant, which was used to describe the Ford. 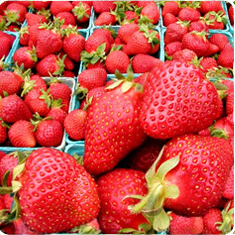 TLV (Triadelphia Lake View) Farm offers pick-your-own strawberries, pumpkins and cut-your-own Christmas trees. They sell their vegetables, fruit, meats, eggs, and honey at several farmers markets and on the farm and operate a CSA. We will be feeding our children out of the same earth as yours. We promise to do our best to provide your family with the freshest, wholesome, naturally grown food possible and work to make our community a better place. Valley Haven Farm was purchased from the O’donnell family in 1935 by Joseph Zoller, Jr. The farm at that time was a dairy farm milking up to 50 head of ayrshire cows and comprised of 175 acres of land. The farm had two mules Jack and Jim used to plow the fields and had everything from chickens to pigs. The farm in 1968 was bought by to Joseph Zoller III who continued to run the family farm but primarly raised beef cattle with up to 45-50 head of cattle. The farm currently is still owned by Joseph Zoller and is a total of 75 acres. His son James Zoller and his family Kelly, Joseph IV and Charlotte live on the farm in the 1904 farm house and have assumed the responsiblity of the day to day maintence of the farm. The farm is currently being used to grow corn, soybean, hay, chickens and vegetables for the CSA. The farm is looking forward to a bright future diversifying to make the farm more viable in the 20th century. Walnut Springs offers a range of annual bedding plants and herbs for wholesale markets. Walnut Springs, Inc. was founded in 1964 by J. Alvin Smith, who has always had a love of ornamental plants. The nursery is family owned and operated. In 2007, Walnut Springs received the Howard County Economic Development Achievement Award. Woodcamp Farm offers premium Angus beef, pork, lamb, eggs, and honey for sale at local farmers markets and through its CSA. You can also find Woodcamp Farm’s meats at several Howard County restaurants. Sixty years ago, the Hough family bought a 345 acre farm in western Howard County to raise Holstein dairy cattle. In the 1970s the family switched from dairy to beef cattle, and began selling Angus cattle locally.